"The Daily Show"'s John Oliver did this send-up of the Michelle Obama-Queen touch on Thursday night's show. A Buckingham Palace spokesman who asked not to be identified because of palace policy said he could not remember the last time the queen had displayed such public affection with a first lady or dignitary. 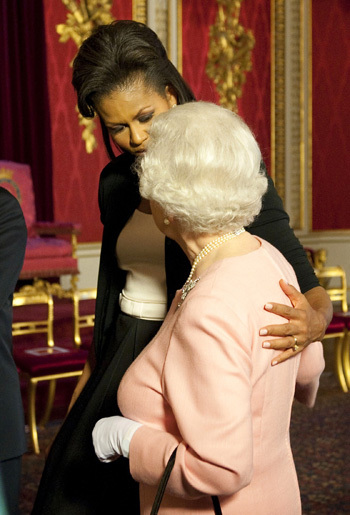 Much is being made of Michelle Obama and Queen Elizabeth's embrace. As the First Lady and Queen chatted at the G-20 reception on Wednesday night, the Queen touched her hand to Michelle Obama's back, and the gesture was then returned. Royal etiquette dictates that the Queen not be touched unless she reaches out first. Patting the Queen's back, however, is almost unprecedented behavior in Buckingham Palace. But did the Queen like it? No-one - including the ladies-in-waiting standing nearby - could believe their eyes. In 57 years, the Queen has never been seen to make that kind of gesture and it is certainly against all protocol to touch her. 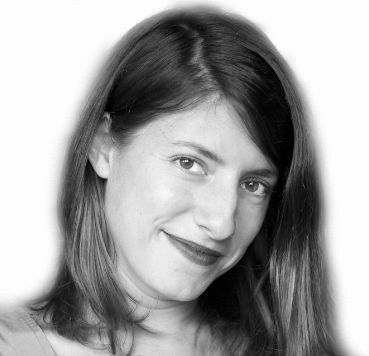 'But she didn't seem to mind a bit and was smiling and joking throughout,' the eyewitness said. Another defense for Michelle Obama, of course, is that she is not a subject of the Queen. (Australians, despite referendums attempting to turn themselves into a republic, still recognize the Queen as their head of state.) The First Lady of the United States is not required to curtsey before her or any other crowned head. In any case, the touch lasted just a second or two, and the Queen did not seem particularly perturbed -- though she appeared slightly surprised as she drew away. What do you think of this gesture? 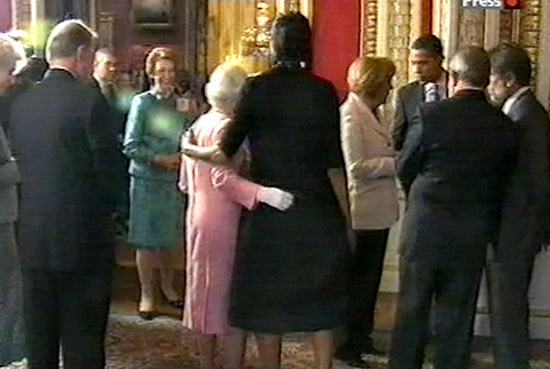 Michelle Obama is well-known for her hugs. See a slideshow of them here.